6452. “Wilson Caldwell Rust,” Find-A-Grave, https://www.findagrave.com/memorial/28706152, 28706152. 6453. 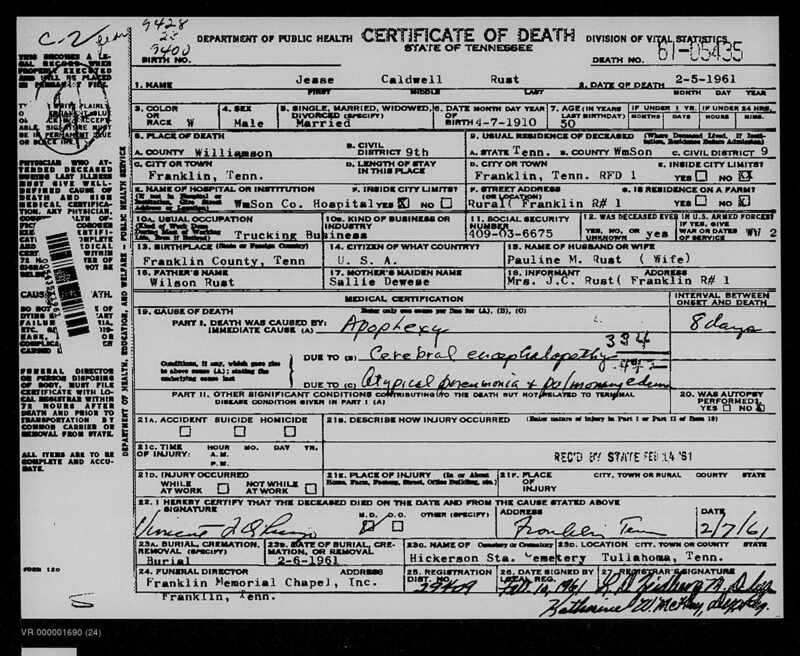 Jesse Caldwell Rust, “Tennessee Death Records, 1914-1963,” February 5, 1961, Franklin, Williamson County, TN, https://www.familysearch.org/ark:/61903/1:1:QKMS-WB43. 6454. 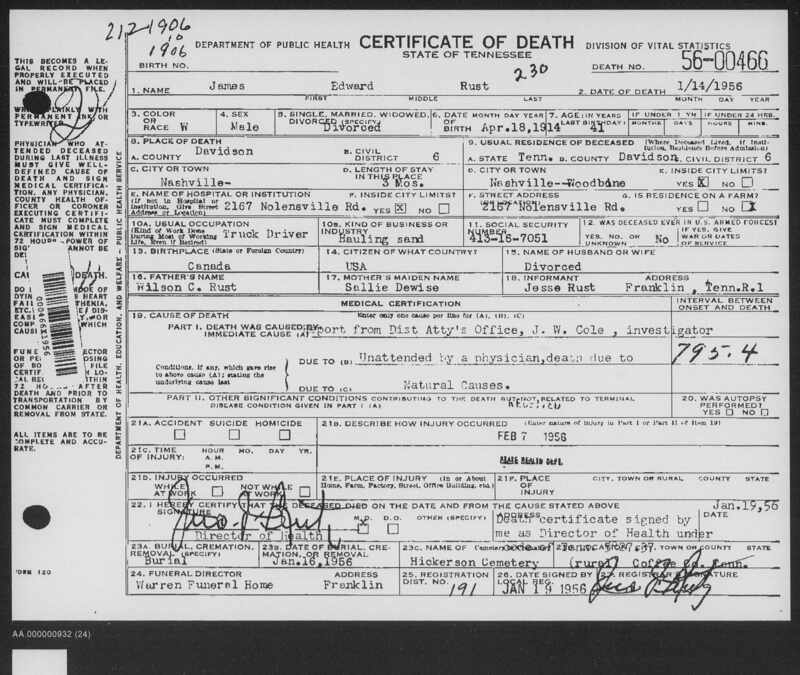 James Edward Rust, “Tennessee Death Records, 1914-1963,” January 14, 1956, Nashville, Davidson County, TN, https://www.familysearch.org/ark:/61903/1:1:QKM9-NBTV. 6455. 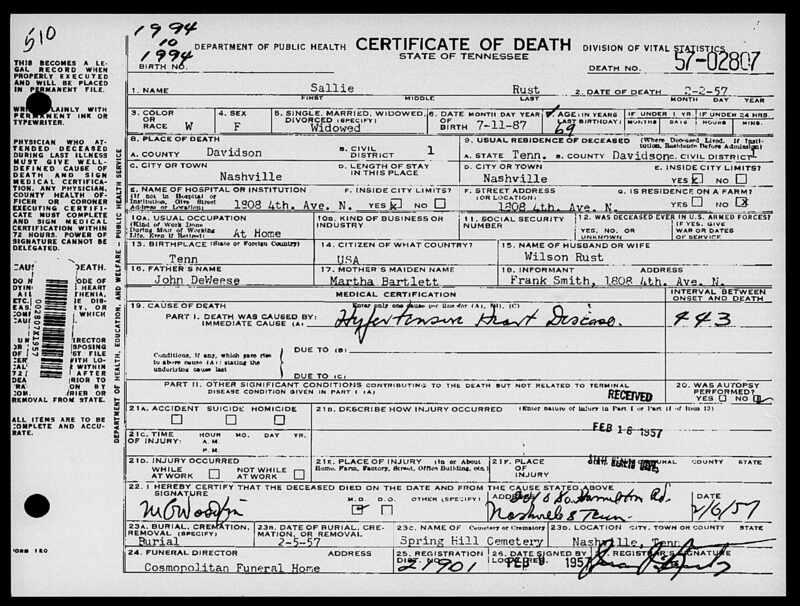 Sallie Rust, “Tennessee Death Records, 1914-1963,” February 2, 1957, Nashville, Davidson County, TN, https://www.familysearch.org/ark:/61903/1:1:QKM9-KYQ3. 6456. 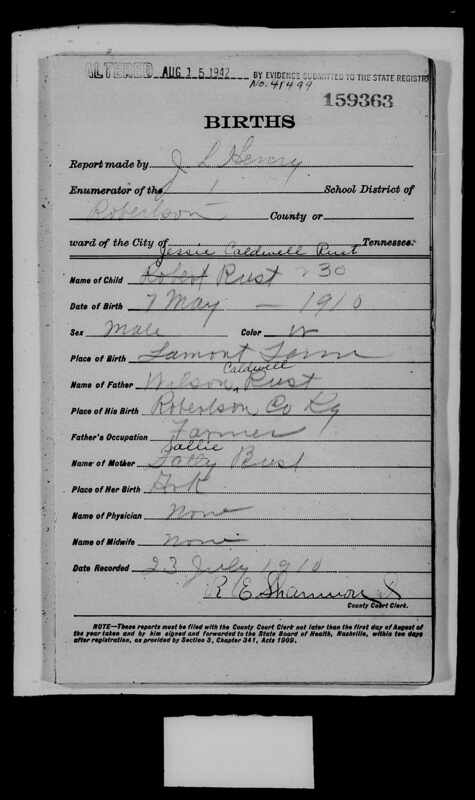 Jessie Caldwell Rust, “Tennessee, Birth Records (ER Series), 1908-1912,” May 7, 1910, Lamont Farm, Robertson County, KY, https://www.familysearch.org/ark:/61903/1:1:Q2H5-CD7W. 6457. “Obituary,” Herbert “Rex” Deweese, Niagara Gazette, Niagara Falls, NY, August 28, 2015. Herbert “Rex” Deweese, a longtime resident of Niagara Falls, died on Friday August 28, 2015 in Erie County Medical Center following a brief illness. He was 93. He was born in Kinistino, Saskatchewan, Canada on May 25, 1922, the son of the late Charles Samuel and Ruby Rebecca (Butts) Deweese. He and his family settled in Niagara Falls when Rex was an infant. He attended schools here and was a graduated of the former LaSalle Jr/Sr High School. Serving in the United States Navy during WW II, he was stationed at the Naval Training Station in Newport, RI and the United States Naval Air Station in Argentia and Newfoundland. He was honorably discharged May 3, 1946. Following his discharge he began his long career as a machinist, first working working for the International Paper Company for ten years, Western Electric for 20 years and retired from Harrison Radiator in 1986. He was a longtime member and supporter of Riverside Presbyterian Church. One of his favorite pastimes was fishing at the family cottage in Canada. He was also active in league bowling with work related teams. Rex always kept up with current events and the Buffalo Bills and was an excellent handyman. He was predeceased by his wife, Jean in 1986, He is survived by his children, Michael R. Deweese (Marybeth) of Bakersfield, VT; Deborah Deweese Schmidt of Niagara Falls; grandchildren, Benjamin Deweese of San Diego; Brettan Collopy (Jason) of Colonial Heights, VA; Matthew Routhier of Niagara Falls; great grandchildren, Dezmon Nelson; Hannah and Haleigh Routhier and Declan McGinley, several nieces and nephews. He was predeceased by his granddaughter, Lisa Harris and siblings, James Howard Deweese and Dorothy Desjardin. Friends may call Sunday after 2 PM in the LANE FUNERAL HOME INC, 8622 Buffalo Avenue, Niagara Falls, where the Rev. Laura Norris Buisch will conduct services at 4 PM. The interment will be private in Memorial Park Cemetery. In lieu of flowers, memorials if desired may be made to Riverside Presbyterian Church. 6458. “Obituary,” Gerald Deweese, Niagara Gazette, Niagara Falls, NY, January 27, 2015. Gerald L. Deweese, a longtime resident of Niagara Falls, died on Monday, January 26, 2015 in Our Lady of Peace Nursing Care Residence. He was 84. He was born in Niagara Falls, New York on December 16, 1930, the son of Brown and Margaret Blanche (Murphy) Deweese. He was a graduate of the former LaSalle Jr/Sr High School, Class of 1948. He served in US Army with the 5th Armored Division and was honorably discharged in November of 1953. After his service in the Army, he graduated from Erie County Technical Institute and was a member of the Tau Alpha Phi.. Mr. Deweese had a long and prosperous career with Great Lakes Carbon as a Chemical Technician. He worked there for many years, retiring in 1992. A member of St. John de LaSalle RC Church, Mr. Deweese enjoyed building boats, models, doing crossword puzzles, jigsaw puzzles and playing solitaire on the computer.. He is survived by his wife of 58 years, Phyllis (Walker) Deweese; three children, Stephen (Deborah) Deweese of White Hall, MD; Jeffery (Cynthia) Deweese of Pahrump, NV and Rebecca (Sal) Moreno of Niagara Falls; six grandchildren, Sam and granddaughter, Sarah" Moreno; Hillary, Kaitlyn, Andrew and Nicholas (Michelle) Deweese; several great grandchildren; his sister in law Josephine Deweese of Lewiston; several nieces and nephews. He was predeceased by his son, Kevin Deweese in 1972; a brother, Robert Deweese and a sister, Marguerite Paterson.. The family will be present Thursday from 2-4, 6-8 PM in the LANE FUNERAL HOME, INC., 8622 Buffalo Avenue, where prayers will be said Friday 9:30 AM followed by a Mass of Christian Burial at 10 AM in St. John de LaSalle RC Church. The interment will be in Gate of Heaven Cemetery with military honors. Memorials, if desired, may be made to St. John de LaSalle RC Church.. Visit www.niagara-gazette.com/obituaries for online guest register. 6459. “Obituary,” Josephine Deweese, Niagara Gazette, Niagara Falls, NY, October 19, 2016. Josephine C. Deweese, age 87, of Missouri City, TX, formerly of Lewiston, passed away on Thursday, October 13, 2016. Josephine was born in Glasgow, Scotland on January 28, 1929 to Michael and Bella Cavanagh and never lost her Glaswegian accent. She relocated to the US at the young age of 18 on the Queen Mary. She married Bob Deweese on June 16, 1951 in Niagara Falls, NY, and they had three daughters, Mary, Anne, and Margaret. Josephine was a longtime member of St. Peter RC Church in Lewiston where she was a member of the Bishop Discussion Group for 35 years. She also was a Volunteer at Mt. St. Mary's Gift Shop for 22 years and at Artpark for 20 years. Josephine was full of life. She had quick smiles and was always ready to give out hugs. She will always be remembered with love. She is survived by her daughters, Mary Deweese (Ramon Day) Mory of Jacksonville, FL, Anne (Brian) Carstens of Shalimar, FL, and Margaret Deweese (Calvin Walwyn) of Missouri City, TX. She is the proud grandmother of Elizabeth and Robert Mory, Justin Taylor, and David Carstens. She is also survived by a brother, Henry Cavanagh of Glasgow, Scotland. She was predeceased by a brother, James Cavanagh; and two sisters, Agnes and Helen Cavanagh. Friends may call at HARDISON FUNERAL HOME, N. Fourth & Ridge Streets, Lewiston on Friday, October 21st from 4-6 PM. A Mass of Christian Burial will be celebrated on Saturday, October 22nd at 10:00 AM in St. Peter RC Church, 600 Center St., Lewiston, with the Rev. Msgr. David G. LiPuma officiating. (Please assemble at Church). Josephine would enjoy it if those in attendance would wear pink in her honor. Burial will follow in Gate of Heaven Cemetery, Lewiston. Memorials may be made to St. Peter's RC Church, 620 Center St., Lewiston, NY 14092. Please visit hardisonfuneralhomes.com for online condolences. 6460. “George Willoughby Tinkess,” Find-A-Grave, https://www.findagrave.com/memorial/102576297, 102576297. 6461. “Clara May Dewees Tinkess,” Find-A-Grave, https://www.findagrave.com/memorial/102576296, 102576296. 6462. Johnnie Tennessee Cook, “Tennessee Death Records, 1914-1963,” September 29, 1958, Springfield, Robertson County, TN, https://www.familysearch.org/ark:/61903/1:1:QKM9-YK7K. 6463. “Martha Brown Freeland Deweese,” Find-A-Grave, https://www.findagrave.com/memorial/38432129, 38432129. 6464. Deweese, Henry L, World War I, 1917, TN, 2825, “United States World War I Draft Registration Cards, 1917-1918,” June 5, 1917, Gallatin, Sumner County, TN, https://www.familysearch.org/ark:/61903/1:1:KZ65-Q8S. Gives birth date as December 11, 1877 and age as 41 instead of December 11, 1876 as other records indicate. Date of registration is not listed but was inferred to be June 5, 1917 by examination of the other records from Sumner County, TN. If he was born on December 11, 1877, he would have been 39 on June 5, 1917 so it appears that possibly more than one error occurred in the recording. 6465. 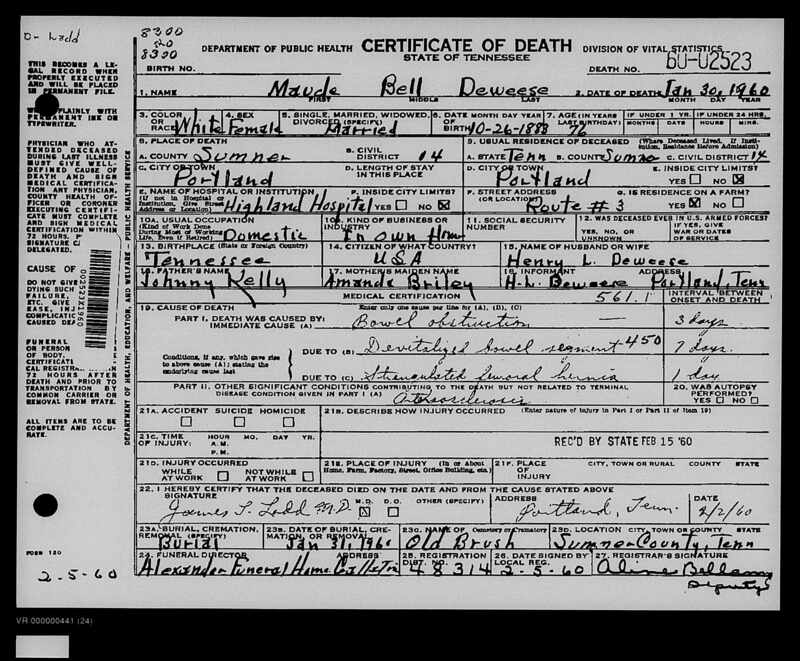 Maude Bell Deweese, “Tennessee Death Records, 1914-1963,” January 30, 1960, Portland, Sumner County, TN, https://www.familysearch.org/ark:/61903/1:1:QKMS-Q3DF. 6466. “Maud DeWeese,” Find-A-Grave, https://www.findagrave.com/memorial/39922995, 39922995. 6467. “Henry DeWeese,” Find-A-Grave, https://www.findagrave.com/memorial/39922981, 39922981. 6468. “Jessie W DeWeese,” Find-A-Grave, https://www.findagrave.com/memorial/29213118, 29213118. 6469. “Maude B DeWeese,” Find-A-Grave, https://www.findagrave.com/memorial/29213113, 29213113. 6470. “Jessie G DeWeese,” Find-A-Grave, https://www.findagrave.com/memorial/38965432, 38965432. 6471. “Mary A DeWeese,” Find-A-Grave, https://www.findagrave.com/memorial/38965442, 38965442. 6472. “Joseph DeWeese,” Find-A-Grave, https://www.findagrave.com/memorial/38990243, 38990243. 6473. “Myrtle E Lane DeWeese,” Find-A-Grave, https://www.findagrave.com/memorial/38990262, 38990262. 6474. “Geraldine DeWeese Bursby,” Find-A-Grave, https://www.findagrave.com/memorial/109615620, 109615620. 6475. “Marion E Bursby,” Find-A-Grave, https://www.findagrave.com/memorial/109615285, 109615285. 6476. “Dorothy J DeWeese Francis,” Find-A-Grave, https://www.findagrave.com/memorial/109561590, 109561590. 6477. “James R Francis,” Find-A-Grave, https://www.findagrave.com/memorial/109562589, 109562589. 6478. “Johnnie N Francis,” Find-A-Grave, https://www.findagrave.com/memorial/109562137, 109562137. 6479. “Mary Jo DeWeese Tarrents,” Find-A-Grave, https://www.findagrave.com/memorial/67074888, 67074888. 6480. “Obituaries,” Mrs. Myrtle Emma Deweese, The Tennessean, Nashville, TN, August 10, 1981, 8. 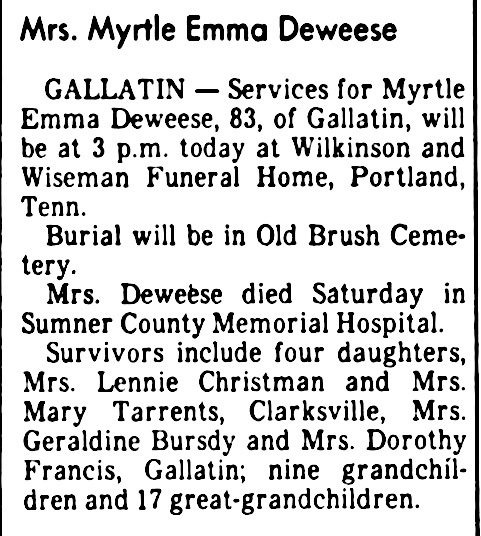 GALLATIN — Services for Myrtle Emma Deweese, 83, of Gallatin, will be at 3 p.m. today at Wilkinson and Wiseman Funeral Home, Portland, Tenn.
Mrs. Deweese died Saturday in Sumner County Memorial Hospital. Survivors include four daughters, Mrs. Lennie Christman and Mrs. Mary Tarrents, Clarksville, Mrs. Geraldine Bursdy and Mrs. Dorothy Francis, Gallatin; nine grandchildren and 17 great-grandchildren. 6481. “Obituaries,” Geraldine D Busby, The Tennessean, Nashville, TN, September 20, 2012, B5. BURSBY, Geraldine D. Age 88 of Gallatin. Passed away Tuesday, September 18, 2012. Service will be held at 2 p.m. Friday, September 21 from Family Heritage Funeral Home. Interment will follow at Crestview Memorial Park. Visitation will be Thursday from 3-8 p.m. and Friday from 12 Noon until time of service. Mrs. Bursby was born October 26, 1923 in Sumner County, TN to the late Joseph and Myrtle Lane Deweese. She is also preceded in death by her husband, Marion Bursby; and sisters, Dorothy Francis, Mary Tarrents, and Lennie Christman. She is survived by her daughter, Linda (Ronald) Gann; grandson, Troy Gann; and great-granddaughter, Katy Gann. FAMILY HERITAGE FUNERAL HOME, (615) 452-7115. 6482. “Obituaries,” Dorothy Jean Francis, The Gallatin News, Gallatin, TN, January 19, 2012, http://www.gallatinnews.com/archive/2012/01/19. Dorothy Jean Francis, age 81, of Cottontown, passed away Friday, January 13, 2012. Funeral service was Sunday, January 15 at 2 p.m. from the chapel of Family Heritage Funeral Home with Brother Doug Parks officiating. Interment followed in Crestview Memorial Park with family and friends serving as pallbearers. Mrs. Francis was born March 11, 1930, in Sumner County, daughter of the late Joe and Myrtle Lane Deweese. In addition to her parents, she is preceded in death by her husband, Johnny Francis, son, Jimmy Francis; sisters, Mary Tarrents and Lennie Christman and one infant brother. She is survived by her daughter, Judy Morris (Steve) of Cottontown; sister, Geraldine Bursby of Cottontown; grandchildren, Trina Lasley, Joey Morris and Nathan Francis; great grandchildren, Dustin Russell (Jessica), Susan Russell, Mitchell Lasley and Jessica Morris and great-great grandchild Camden Russell. Mrs. Francis was a member of Cottontown Church of Christ and worked for Sumner County Board of Education. Online condolences may be submitted at familyheritagefh.com. 6483. 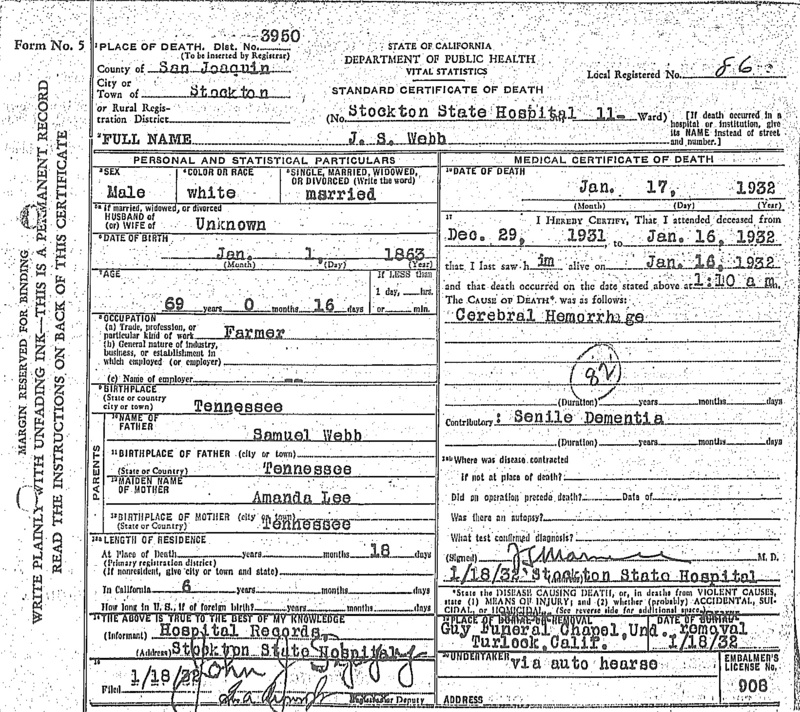 John Smith Webb, “California, County Birth and Death Records, 1800-1994,” January 17, 1932, Stockton, San Joaquin County, CA, https://www.familysearch.org/ark:/61903/1:1:QV37-J7M9. 6484. “Licenses Issued,” Ora Lee Hollis and Pearl Webb Ploof, Oakland Tribune, Oakland, CA, February 24, 1944, 31. HOLLIS, Ora Lee, 47, Patterson. PLOOF, Pearl Webb, 47, Patterson. 6485. “Ora L Hollis,” Find-A-Grave, https://www.findagrave.com/memorial/182356204, 182356204. 6487. “Marguerite Paterson,” Find-A-Grave, https://www.findagrave.com/memorial/152122196, 152122196. 6488. “Lloyd H Paterson,” Find-A-Grave, https://www.findagrave.com/memorial/152296270, 152296270. 6489. “Former State Sen. Paterson dies Convicted of stealing funds while Niagara treasurer,” Lloyd H Paterson, Democrat and Chronicle, Rochester, NY, December 29, 1988, 12. ALBANY — Former State Sen. Lloyd H. Paterson, who lost his Senate seat after being convicted of stealing public funds while he was Niagara County treasurer, died yesterday. He was 63. Paterson, who had homes in Niagara Falls and Albany, became ill Monday while driving back to Albany from a holiday visit to Niagara Falls and was admitted to Albany Veterans Hospital that night. At the time of his death, he was on the Albany staff of the New York Power Authority as a legislative representative, a job he took in December 1983 after completing five years probation for his 1977 conviction on 33 counts of grand larceny during his term as treasurer. Republican Paterson entered public life in 1957 as a member of the Niagara County Board of Supervisors. The former Niagara University basketball star spent two years on the board and then resigned to accept the post of deputy commissioner of the state Athletic Commission. He held that position until 1964, when he was elected Niagara County treasurer. After three terms as treasurer, he was elected to the state Senate in 1972, representing the 60th District comprised of Niagara and Orleans counties, the City of Tonawanda and Grand Island. In December 1977, Paterson was indicted by a Niagara County grand jury on 38 counts of grand larceny, falsifying records and official misconduct in the theft of $93,400 in public funds. He was convicted on 33 counts, thus forfeiting his Senate seat. Paterson was placed of five years' probation, ordered to make restitution of $1,339 for money missing from the county's Blue Cross-Blue Shield accounts and fined $18,500. 6490. “Robert E Deweese,” Find-A-Grave, https://www.findagrave.com/memorial/95718654, 95718654. 6491. “Saskatchewan Cemetery Transcripts, ca. 1850-1994,” https://www.familysearch.org/ark:/61903/1:1:QK9G-6LH3. 6492. “Marian Louise Tinkess Landy,” Find-A-Grave, https://www.findagrave.com/memorial/73419432, 73419432. 6493. “George Dickson,” Find-A-Grave, https://www.findagrave.com/memorial/73413796, 73413796. 6494. “Patrick Peter Landy,” Find-A-Grave, https://www.findagrave.com/memorial/87693617, 87693617. 6495. “David Landy,” Find-A-Grave, https://www.findagrave.com/memorial/87693639, 87693639. 6496. 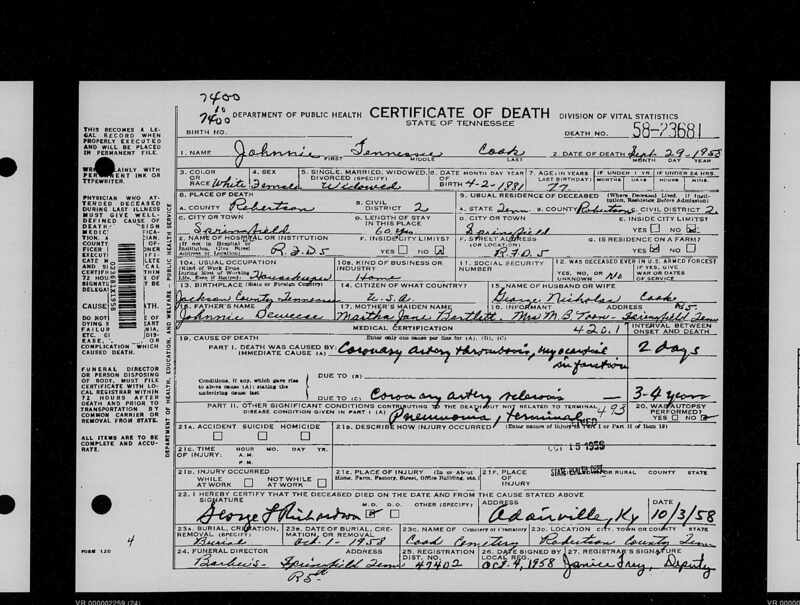 George Dickson, “British Columbia Death Registrations, 1872-1986; 1992-1993,” September 28, 1951, Salmo, BC, Canada, https://www.familysearch.org/ark:/61903/1:1:FL5Z-XZQ. 6497. David Landy, “British Columbia Death Registrations, 1872-1986; 1992-1993,” August 27, 1960, Nelson, BC, Canada, https://www.familysearch.org/ark:/61903/1:1:QK6G-ZTWT. 6498. “Thomas Manning Dent,” Find-A-Grave, https://www.findagrave.com/memorial/29670960, 29670960.